2/11/03 - Rumble's Cousin "Logan"
Logan playing in the snow (after he lost his green ribbon for Rumble). 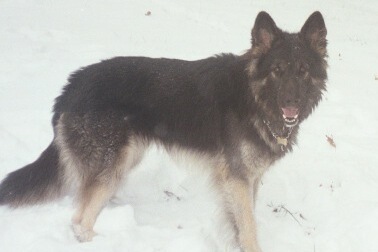 Logan loves the snow, as does Rumble! 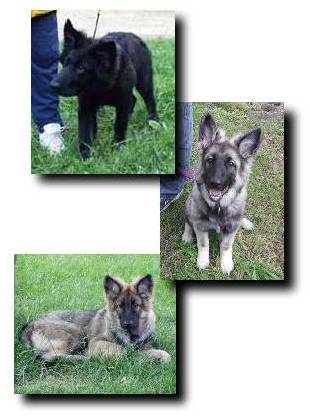 Rumble's little nieces and newphews are growing like weeds. 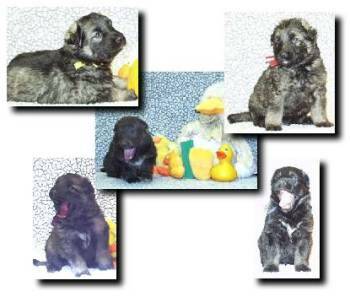 The little one on its back at the bottom of the photo has the same goofy sense of humor as Uncle Rumble! 2/14/03 - Our Valentine to You! 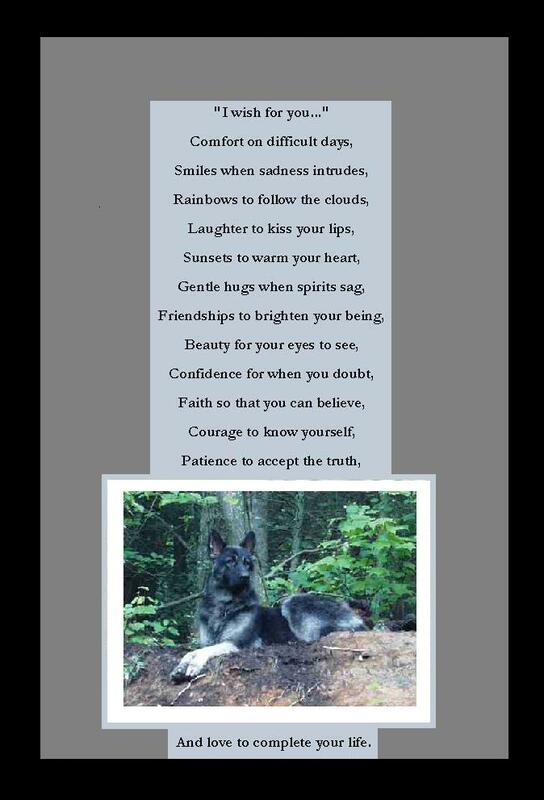 Heartfelt warm wishes to every Friend of Rumble's from Rumble's entire extended family. Thank you for all you've done, for your encouragement, and for just being here with us. Chili's pups awakening from a nap (hence the yawns). The little guy in the middle is has white toes and a white heart on his chest, just like his Uncle Rumble. Like his uncle, this little guy's ribbon is also green. 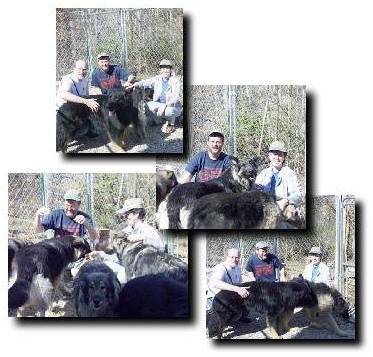 These wonderful Friends of Rumble who have volunteered countless hours to help us try to locate Rumble paid us a delightful visit on 3/09/03. 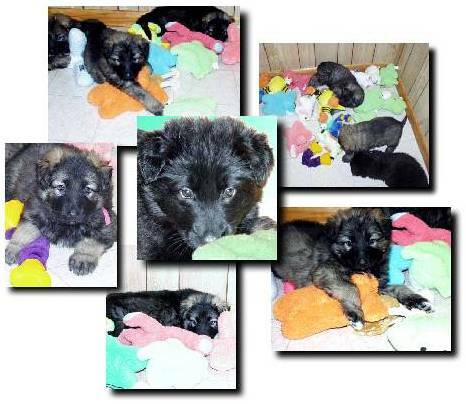 The green toys were given to Chili's pups by one of Chili's brothers on behalf of their beloved missing littermate, Rumble. 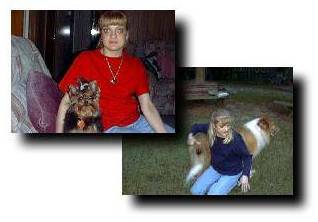 Newspaper article sent to us by friends about dogs missing (and possibly stolen) in Buckingham County, VA.
Cheryl has told us the touching story of how Rumble serves as a link to her fiance, David, who died in October 2002. 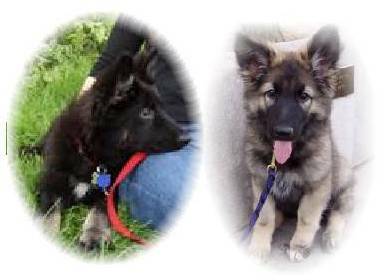 "Maka" (left) lives in California and he looks like a small version of Rumble. "Mystic" (right) favors Chili and she is happily at home in Ohio. 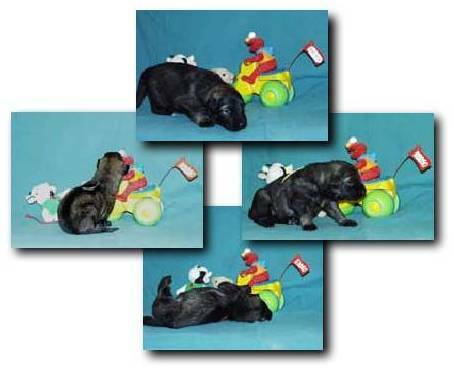 4/30/03 - Rumble's Grandpa "London" & Litter Brother "Noah"
London and Noah live with their human mom and dad in Pennsylvania. This photo was taken during a snow in February. Trooper with his little friend Liebe. 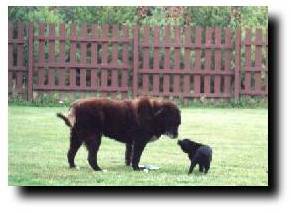 Trooper - - a loving, gentle Newf/Lab and a true Friend of Rumble's. 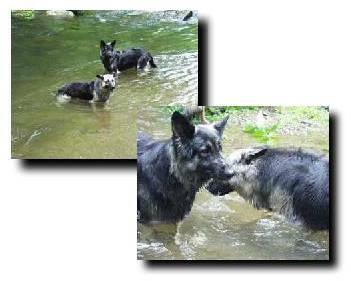 5/12/03 - Rumble's litter brother, "Noah"
Noah got thirsty during a walk in the county park, so did the logical thing! 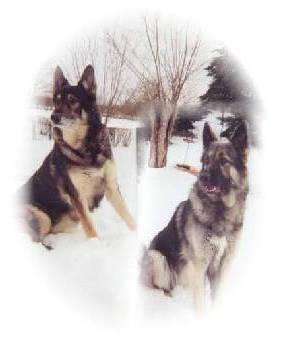 "London," maternal grandpa to Rumble and Noah, can be seen in the background of the second photo. 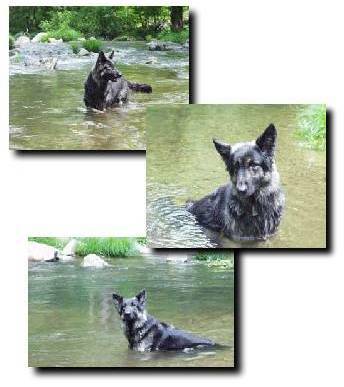 5/28/03 - Rumble's mom "Bita"
Bita and other members of Rumble's family had great fun swimming in the Tye River on May 25th. 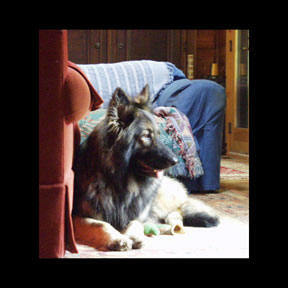 Bita loves to have her picture taken! 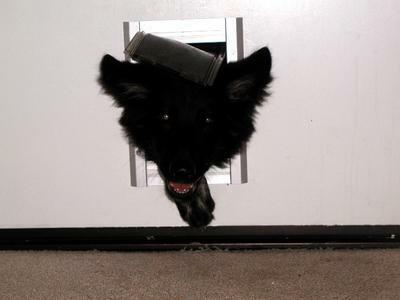 Maka, who lives in California, is getting so big, so fast, that he's surprising even himself! 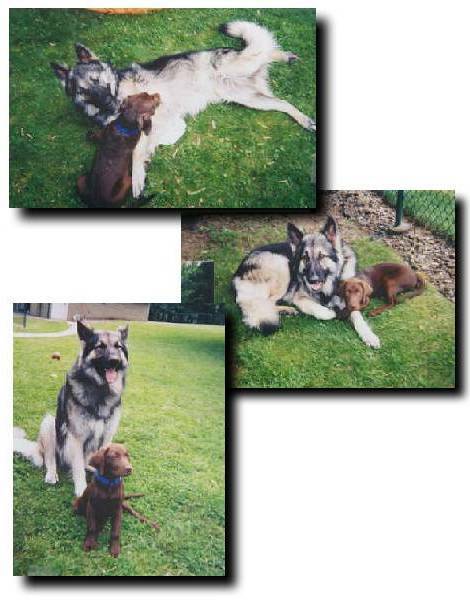 6/10/03 - "Noah" and "Hershey"
6/15/03 - Rumble's dad, "Raider"
A Father's Day wish that they'll be together by next Father's Day. Rumble and his dad are very close. From top to bottom: Sequoia, Diva, and Mystic - All lovely!